Pat Cox was born on 28 November 1952 in Dublin, Ireland. 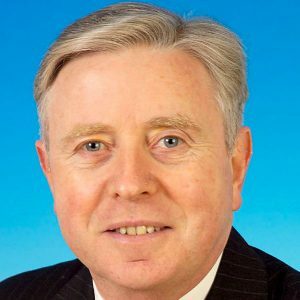 Following his education at the University of Limerick and Trinity College, Dublin, he worked as a journalist and TV presenter for the national public service broadcaster of Ireland RTÉ during the 1980’s. In 1989 he was elected MEP and served in the European Parliament until 2004. From 1998 to 2002 he was the president of the ELDR group, the following two years he functioned as President of the European Parliament. After retiring from his position as MEP, Cox became President of the European Movement International, holding the office until 2010. Since 2010 he serves as President of the European Parliament Former Members’ Association. In addition Cox is a member of a broad range of advisory boards in the private and public sector and has been involved in several projects on European levels. In 2004 he received the Charlemagne Prize for his merits in the Eastward extension of the European Union.